Now on sale in Ireland, the new Peugeot 2008 capitalises on Peugeot’s expertise acquired from the 3008 Crossover and builds on the success of the Peugeot 208, Irish Small Car of the Year 2013. With a choice of efficient petrol and diesel engines, the new Peugeot 2008 is a compact crossover perfect for town driving, yet at home on country roads. It offers customers an innovative cockpit designed around a small steering wheel and a quality, spacious interior all in a compact, stylish package. Prices start from €18,595 ex-works for the 1.2 VTi 82bhp petrol Access version or from €19,515 ex-works for the 1.4 HDi 70bhp diesel Access version. At just 4.16m long and 1.74m wide and weighing just 1045kg, the new 2008 crossover, available in eight different colours, is elegant and sophisticated. The front face of 2008 adopts the stylistic codes of the Peugeot marque. An upright, floating grille and signature headlamps are enhanced by LED daytime running lamps. The sculpted bonnet and wings complete a reassuring impression of precision, protection, and strength. The boot, with a low loading sill, has a curved roof above it, inspired by the RCZ. A wide tailgate is framed on either side by three signature, luminous LED claws. Roof bars, standard on all levels, finish the vehicle perfectly. The generous glazed surfaces promise an airy, spacious interior. Inside the cabin, drivers will find a aircraft-type handbrake close to hand. The fascia is covered in a silky material and satin chrome brightens vents, the handbrake lever, gear lever, and touchscreen (which is standard from level 2 ). As on the outside, signature lighting is a constituent part of the passenger compartment: blue LED backlighting surrounds the head-up dials and panoramic glass roof as standard on Allure models. With a wheelbase of 2.54m, rear passengers have a generous amount of leg room, thanks to the specially designed front seat backs. Numerous well-designed storage compartments ensure keys, smartphones, and other everyday objects always find a place in the 2008. Without leaving their seat, passengers can access the boot even when the vehicle is moving. From the outside, access to the boot is just as easy with a large rectangular opening and a low loading sill, just 60cm high, trimmed with a brushed stainless steel protector. The split folding bench seat allows you to increase load volume from 360 to 1194dm3, (22dm3 under the floor ), with a single gesture. One press on the control at the top of the rear seat back is all it takes to fold the seat back. 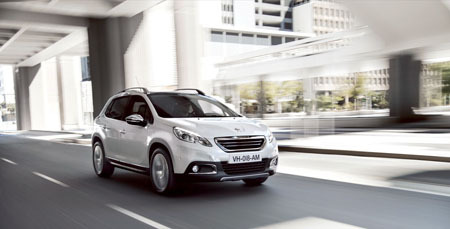 Peugeot’s 2008 has been developed to offer passengers safety of the highest level. The small steering wheel ensures ease of control and driving precision. The head up instrument panel reduces the amount of time eyes are taken off the road. The large 7” touch screen to control audio/navigation is at the driver’s fingertips. The driver can also count on the cruise control-speed limiter which is standard on all versions. All versions are fitted as standard with ESP, which combines anti-skid regulation (ASR ), stability control (CDS ), emergency braking assistance (EBA ) and electronic brake force distribution (EBFD ). The active footrest and the collapsible steering column contribute to the protection of the driver, while the connection between the front doors and the centre pillar is guaranteed by a retention pin. Peugeot boast that combined with its lightweight design and aerodynamic silhouette, a wide range of technologically advanced petrol and diesel engines position the 2008 as the leader in its segment in terms of low fuel consumption and CO2 emissions. In Ireland, the engine line-up includes: 1.2 l petrol VTi 82bhp five-speed manual (CO2: 114g/km, Band A4 ); 1.4 l HDi diesel 68bhp five-speed manual (CO2: 104g/km, Band A3 ); 1.6 l e-HDi 92bhp six-speed manual Stop&Start (CO2: 103g/km, Band A3 ); 1.6 l e-HDi 92bhp six-speed EGC gearbox Stop&Start (CO2: 98g/km, Band A2 ); and 1.6 l e-HDi 115bhp six-speed manual Stop&Start (CO2: 105g/km, Band A3 ). A new 1.2 litre petrol e-VTi 82bhp118Nm five-speed EGC Stop Start offering CO2 emissions of 99G will go into production in October. In the following months, the 2008’s engine range will be extended further with versions of the turbocharged three-cylinder petrol engine, with two new power outputs available: 1.2-litre e-THP 110 and 1.2-litre e-THP 130. Peugeot will offer three versions of the new Peugeot 2008 in Ireland: Access, Active, and Allure. Standard specification across the range includes LED daytime running lights, air conditioning, ESP, cruise control + speed limiter, six airbags, front electric windows, a spare wheel, roof rails, and child safety locks. The Active model gains rear parking sensors, a leather steering wheel, auto wipers and lights, front fog lamps, electric folding door mirrors, and 16” alloy wheels. Allure versions gain cornering fog lamps, a panoramic + LED feature glass roof, dual zone air conditioning, privacy glass, rear electric windows, and external chrome pack.